A South Carolina TV manufacturing facility will close its doors, and Trump's threatened auto tariffs could do yet more damage to the state's economy. The latest casualties from President Donald Trump’s trade war are 126 jobs at a plant where televisions are built. 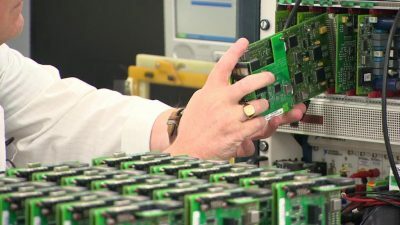 “The layoff and closure is a result of the new tariffs that were recently and unexpectedly imposed on many goods imported from China, including the key television components used in our assembly operations in Winnsboro,” said the letter. The jobs lost in Winnsboro are unlikely to be replaced quickly. Even before the tariffs hit, Fairfield County (where Winnsboro is located) was struggling: It recently lost a textile mill that employed more than 200 people, and the planned construction of a nuclear power plant was canceled. In May, the most recent month for which data is available, Fairfield County had the highest unemployment rate in South Carolina. Trump’s tariffs, which are really just taxes on imported goods, are likely to cause the most pain in places like Fairfield County. Large, successful businesses are not immune to the consequences of trade barriers, but they have more ways to deal with suddenly higher production costs than small companies that were already struggling to stay afloat. And the president is not done with his assault on South Carolina’s manufacturing sector. If Trump follows through with a threat to impose tariffs on automobiles and the parts used to build them, it could wreck havoc on the state’s economy. In comments submitted last month to the U.S. Commerce Department, which is studying the possibility of placing tariffs on cars and car parts, Germany-based BMW said those import taxes could force it to reduce production and cut jobs at its Spartanburg, South Carolina, plant. That facility employs about 10,000 workers and is BMW’s largest manufacturing facility in the world. The trickle-down effects of tariffs could jeopardize another 35,000 jobs at American companies that supply parts for that plant, BMW warned. Just the threat of those auto tariffs is hurting the state. The Swedish automaker Volvo has paused plans to hire 4,000 additional workers at its production facility near Charleston, citing uncertainty over American trade policy. South Carolina is quickly becoming a microcosm for the national debate over tariffs. It’s a state that Trump won by more than 14 points in 2016, but it’s also a place where agriculture and industry—the two sectors of the economy most likely to take a hit from the trade war—are vitally important. Unlike most other East Coast states, South Carolina lacks major cities that serve as hubs for major financial services or tech firms. It’s a state that has benefited tremendously from international automobile manufacturers’ production facilities, but it’s also a state where the loss of a television manufacturing plant can derail a small town. Trump has said his trade war of choice would be “good and easy to win.” Secretary of Commerce Wilbur Ross has shrugged off tariff-caused job losses as mere “hiccups” along the road to making America great again. In places like Winnsboro, South Carolina, those comments probably ring especially hollow.